Train, Great Loss of Life. Was swept away and no more seen. Two hundred lie beneath the foam. Travellers from Dundee would ride. So safe and firm the bridge did seem. Was doom'd to be the travellers grave. Many will ne'er be seen again. As on the bridge the train did fly. Who travelled on that fatal rail. It meant certain death to one and all. So soon had found untimely graves.
" ... 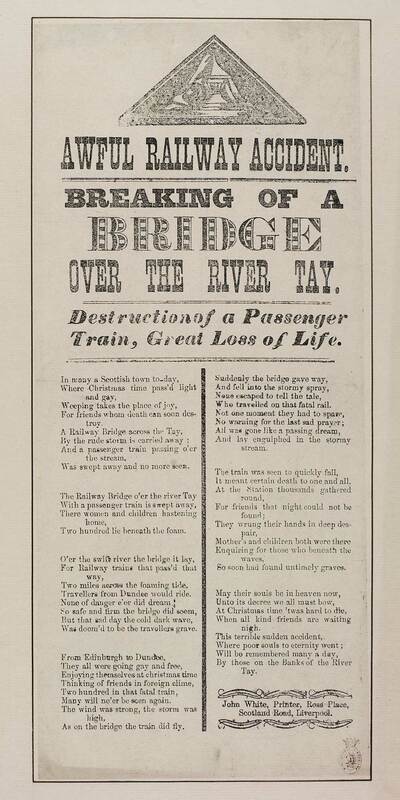 Breaking of a bridge over the River Tay Destruction of a passenger train, great loss of life". First line reads: In many a Scottish town to-day. In two columns with an illustration above the title.